It's a good thing Atkins wasn't around in the ancient world because the staples of the ancient Egyptian diet were bread and beer. Bread for the poor was coarse and often contained sand so most adults would have had pretty worn down teeth. Of course, the average life expectancy was somewhere around 35 so who cares if you're losing your teeth at 20? Workers on monumental projects were actually paid for their work with bread and beer as ancient Egypt was not a cash-based economy. The fellahin diet was supplemented with onions, (priests were forbidden to eat them due to their aphrodiasic qualities), garlic, leeks, and dried fish (Ummm... ick!). The poor rarely would have had the occasion to eat any other meat. The royal house, the rich, and the temples would have had access to beef, but that's about it. Veggies eaten included celery, radishes, cabbage, endive, cucumbers, and papyrus roots (those mostly eaten by the poor). Fruits included grapes, watermelon, apples, pomegranate, mulberry, and date palms. Pears, peaches, cherries, and almonds were introduced by the Romans. 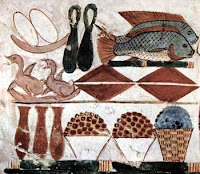 Tiger nuts, olives, lentils, peas, and other beans were also eaten, although the Greeks once reported that Egyptians refused to sow beans because they found them unclean. They have been found in numerous tombs so perhaps that's just another case of Herodotus being off the mark. The rich would have enjoyed access to beer, wine, much finer breads (no sand! ), water fowl, melons, raisins, dates, figs, onions, lettuce, and other veggies. Their foods would have received such spices as dill, coriander, cumin, cinnamon, and rosemary. Honey was also very popular as a sweetener and vinegar was also used in cooking. Whew! There you have it- tons of foods to populate any future eating scenes. Anyone have some papyrus roots I can munch on?